Yes, they're still fighting for your vote to be counted. A Federal judge recently dismissed their lawsuit charging that the 2004 Ohio Presidential Recount was gamed. The reason for the dismissal: The point was now moot, since the 2004 recount procedures would not be used again. But, according to 2004 Green Party Presidential Candidate David Cobb, what the judge didn't know when he dismissed the case, was that Ohio's SOB SoS, J. Kenneth Blackwell, recently announced that recount procedures would be the same in the future. Game back on, says Cobb in his motion to re-instate the case. The Ohio Recount lawsuit, which was dismissed by a federal judge earlier this month, should be re-instated because Ohio Secretary of State Kenneth Blackwell is still using the same flawed recount procedures he did in 2004, according to a Motion filed Friday by lawyers for 2004 Green Party presidential candidate David Cobb (pictured at right). "Our suit was dismissed on the basis that Blackwell's obstruction of the 2004 presidential recount is now a moot issue. However, in making his ruling, the judge was unaware that Blackwell issued recount guidelines in 2005 which are identical to the inadequate procedures he used in 2004. Our Motion to the Court asks the judge to take this new information into account and to deny Blackwell's Motion to Dismiss the case," said Blair Bobier, the Media Director for the Green Party's 2004 presidential campaign. Lawyers representing Cobb and his Libertarian counterpart, Michael Badnarik, filed the Motion to Alter and Amend on February 17, 2006, in the U.S. District Court in Toledo, Ohio. On November 17, 2005, Secretary Blackwell issued Directive No. 2005-32 which established that the recount procedures used in Ohio in 2005 would be identical to those used in 2004. First, here is a link to a story in the Feb. 22 edition of the Los Angeles Times. Now, here are more details on this situation, with corroborating links, from I post I wrote for Arianna Huffington's blog. This is the link with important information on how to help Steve Heller. Another way to help Steve is by writing a letter to the editor of the Los Angeles Times. You can use the same talking points from my post (the link above) in your letter to the editor. Directions on how to send a letter to the editor can be found at this link under http://www.latimes.com/news/opinion/letters/ Their snail mail address is Letters to the Editor, Los Angeles Times, 202 W. 1st Street, Los Angeles, CA 90012. They want letters to be 150 words or less, with your name, address and daytime phone number. I thank you in advance for any help you might be able to give Steve. He is a patriot and a whistleblower and should not be prosecuted. And again, this memo can be forwarded to anyone you think might be interested. Editor note: In Ohio, the Republican dominated government passed HB3, which effectively disenfranchised up to 3 hundred thousand eligible (and mostly democratic) voters, while at the same time making a recount unaffordable, prohibiting a legal challenge to the election result, and…believe it or not…removing the requirement for post election audit of electronic voting machines. COLCHESTER, Conn., Feb. 11 /PRNewswire/ — Scott+Scott, LLC (http://www.scott-scott.com/), which initiated on December 13, 2005 the first securities fraud class action against Diebold, Inc. ("Diebold" or the "Company") and certain of its officers and directors, will file a Motion for Lead Plaintiff and Lead Counsel this Monday, February 13, 2006. According to the complaint, Diebold "remained unable to assure the quality and working order of its voting machine products." "It is further alleged that the Company's false and misleading statements served to conceal the dimensions and scope of internal problems at the Company . . culminating in false representations of astonishingly low and incredibly inaccurate restructuring charges for the 2005 fiscal year . . ."
"The complaint also alleges over $2.7 million of insider trading proceeds obtained by individual defendants during the Class Period." The action is pending in the United States District Court for the Northern District of Ohio (No. 05CV2873). The Class is defined in the complaint drafted by Scott+Scott as those who purchased Diebold securities between October 22, 2003, and September 21, 2005, inclusive (the "Class Period"). Would a president who believes he has spy powers, the right to torture, the ability to wage illegal wars based on bogus, manufactured intelligence reports, simply refuse to spy on Kerry and rig an election electronically? 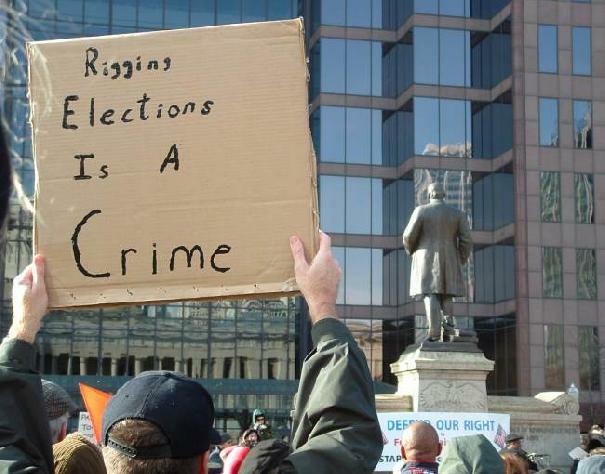 In Ohio, two burglaries occurred against the Democratic Party in Lucas County and Franklin County just prior to 2004 election involving computer theft. Congress must investigate whether Bush used the NSA for partisan political gain during the 2004 election, and whether any NSA Bush operatives or other members of the security industrial complex had access to e-voting machines, central tabulators or the communication lines that delivered the voting results. Gore Vidal Delivers State of the Union: "Let the Powers That Be Know There is Something Called We the People of the U.S. and all Sovereignty Rests in Us." And now here we are planning new wars, ongoing wars in the Middle East. And so as he comes with his State of the Union, which he is going to justify eavesdropping without judicial warrants on anybody in the United States that he wants to listen in on. This is what we call dictatorship. Dictatorship. Dictatorship. And it is time that we objected. Don't say wait ‘til the next election and do it through that. We can't trust the elections, thanks to Diebold and ES&S and all the electronic devices which are being flogged across the country to make sure that elections can be so rigged that the villains will stay in power. And one result was the Foreign Intelligence and Surveillance Act (FISA), which was enacted expressly to ensure that foreign intelligence surveillance would be presented to an impartial judge to verify that there was indeed a sufficient cause for the surveillance. It included ample flexibility and an ability for the executive to move with as much speed as the executive desired. I voted for that law during my first term in Congress and for almost thirty years the system has proven a workable and valued means of affording a level of protection for American citizens, while permitting foreign surveillance to continue whenever it is necessary. And yet, just one month ago, Americans awoke to the shocking news that in spite of this long settled law, the Executive Branch has been secretly spying on large numbers of Americans for the last four years and eavesdropping on, and I quote the report, "large volumes of telephone calls, e-mail messages, and other Internet traffic inside the United States." The New York Times reported that the President decided to launch this massive eavesdropping program "without search warrants or any new laws that would permit domestic intelligence collection." - New legislation will take the state of Virginia a long way toward giving the voters in the state confidence that their vote is being correctly counted. As reported by VoteTrustUSA both HB 1243 and SB 424 would require that electronic voting machines be equipped to produce a paper record of each vote that can be verified by the voter and used in audits and recounts. They further mandate a 5% random post election manual audit of 5% of the voter-verified paper records. In the case of a discrepancy between the paper and electronic totals, the paper record shall take precedence in a recount unless the court finds clear and convincing evidence that there is reason to do otherwise. VoteTrustUSA has joined Virginia Verified Voting and The New Electoral Reform Alliance for Virginia in an Action Alert encouraging Virginia voters to send an email to their legislators to urge them to pass this legislation. - The story that I hate to relate is the betrayal of Leon County, Florida and Ion Sancho by ES&S. VoteTrustUSA reports that after agreements and handshakes by Mr. Sancho and ES&S a message was left on Mr. Sancho's cell phone from ES&S telling him that there would be no deal and that ES&S would not be able to provide any voting system to Leon County. According to the Tallahassee Democrat Mr. Sancho is now looking to the lawyers to see what actions can be taken against ES&S for their betrayal. We are always happy to announce that another state has joined the growing list of "Green States" which require a voter verified paper audit trail. The list became 26 strong this week with the addition of Wisconsin when Governor Doyle signed Assembly Bill 627 into law. A National Action Alert was put out this past week with the revelations of Diebold software problems and the admitted presence of federally banned 'interpreted' code on their voting machines. The Action Alert asks citizens to send an email to the Election Assistance Commission commissioners and the Independent Test Authority Secretariat to demand that they do their job and insist that the ITA does its job in decertifying the Diebold software until such time as the banned software is removed. OH: Tuscarawas County - County to Diebold: About our machines? The future of our voting is up for grabs. Allegheny County is about to upgrade our voting machine infrastructure to dramatically increase accessibility to the blind and the disabled -- without causing a local budget crunch. At the same time, we're risking the integrity and fairness of every vote we'll cast for the next decade. Concerned voters -- and we hope that means you -- should speak up right now to protect your voting rights. Transparency and verifiability of electoral processes are essential to our system of representative democracy. Not only must election results be both accurate and not subject to clandestine manipulation, but voters also need to have confidence that their ballots are being cast and counted in accordance with their wishes. methods for city elections and are poised to convince the city council to place them on the June 2006 ballot. Election Reform Activists are discussing various ways to improve the integrity of the election process, including Post Election Audits, Parallel Elections, Exit Poll support, pre-election voter registration verification, and other initatives. Volunteers will be needed….see future newsletters for details. This newsletter edited by Pete Johnson. Please submit comments and articles for the next newsletter to pjohnso6@insight.rr.com. COLUMBUS, Ohio - A federal judge has thrown out a lawsuit over Ohio's recount of the 2004 presidential election, leaving only one court challenge remaining from the state's role in the re-election of President Bush. U.S. District Judge James Carr in Toledo threw out the suit filed by a voting rights group on behalf of the Green Party and Libertarian candidates. Tuesday's dismissal, barring an appeal, leaves active only a suit filed by the League of Women Voters of Ohio.